Chevy introduced the fourth generation of its COPO Camaro at the SEMA show today; another limited run muscle car that should set drag racing fans' mouths to salivating. 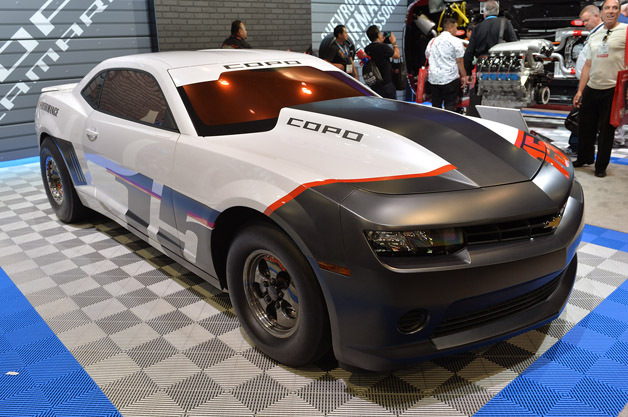 Just 69 examples of the 2015 COPO will be built (the same as the first three runs of the car), with customers able to choose between 350-, 396 -and 427-cubic-inch naturally aspirated V8 engines, or a supercharged 350. The car on the show stand uses that last one, the supercharged "LSX" V8 with a many 2.9-liter Whipple supercharger. The hand-built dragsters come fitted with an NHRA-approved roll cage and safety harness, a unique suspension and a solid rear-axle in place of the standard Camaro's independent setup. 2015 Chevrolet COPO Camaro is the king of our quarter-mile dreams originally appeared on Autoblog on Tue, 04 Nov 2014 20:01:00 EST. Please see our terms for use of feeds. NEWS: Who Needs A COPO Camaro When You Can Buy This Super Cheap Stripped SS?